Trick Out Your Snail and Race It In the Big Leagues! You’ve raced cars, boats, horses, motorcycles and even dragons in the past. It’s now high time to feel the wind on your face with something nobody expects: garden snails! Infusing these mollusks with the right brand of nitrous oxide turns nature’s favorite slowpokes into mean green racing machines, making for some of the most intense racing the world has ever seen in centuries. Based off of DreamWorks’s Turbo, Turbo Racing League puts you into the spiral shell of another one of these high-speed invertebrates and sets you off on the most ludicrous career a snail could ever imagine. Race other snails, beat the competition, use your winnings to tune yourself up, and enter even more difficult races to become the fastest snail in the world! The concept of racing a fast snail may sound crazy and it is. However, that does not mean it can’t be fun. 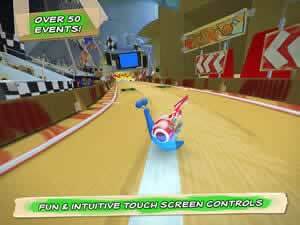 You’ll zoom around the track like a madman, bank around turns, and pull off crazy stunts like any other speedy animal or vehicle. Launch your snail from the slingshot with a precisely timed swipe of your finger. Power slide to get around tight corners. Hit accelerators to get a quick burst of speed and go ahead of the competition. Slither down multiple paths in the track. Who knows? You just might find a shortcut. Ascend ramps to make courageous and aerodynamic leaps. Grind on rails. Lean to the sides or slide on them upside-down. Collect tomatoes while you’re on the move. They’ll come in handy later. Choose from a variety of control schemes. Move your snail using touchscreen buttons, thumbsticks, physical buttons or the accelerometer. You might be able to accept that snails can in fact take part in high-speed races, but what else can you do with them? Snails are just slimy little animals; you can’t customize them or buy new part to improve their performance. If that’s what you think, then you are wrong. 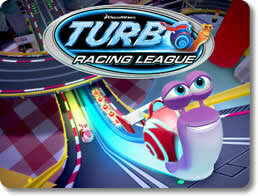 In Turbo Racing League, every snail has the soul of a race car and the same amount of potential waiting to be unlocked. Customize the look of your snail. Choose a gender, alter the color of his or her skin, and give your shell a stylish paint job. Buy components like spoilers to change your snail’s appearance and improve his or her performance in a few key areas. Upgrade your snail’s speed, acceleration, steering and boost. Acquire new stuff for your snail by using the tomatoes you get in the races. Racing is just as competitive a sport for snails as it is for humans. Snails that come in last place don’t get cheers, fans or endorsement deals after all. Many great rewards await the snails that reach the top of their games, so be sure to hit the tracks regularly in order to get them. See if you can earn a three-star rating on every track in the game. Try and beat the record times to earn a bonus in tomatoes. Climb the online leaderboards and show everyone whose snail is boss. With Turbo Racing League, you can enjoy a not-so-conventional racing game that’s every bit as deep as its more conventional competitors. It’s fast, challenging, and it’s all brought to life with sharp 3D visuals. 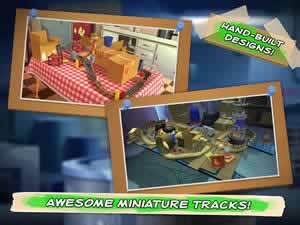 If the idea of racing snails sounds intriguing or you just can’t wait to catch DreamWorks Animation Studios’ Turbo, then get in the slingshot and launch yourself to glory with Turbo Racing League!